Awoken by Brody (one of my cocker spaniels puppies) kissing my face swiftly followed by Eben and Suzie Brodys mother. Thought I better get up and greet the day so pressed the buzzer for my PA had a quick wee then waited for my first cuppa in bed, don’t get up too early these days. Had breakfast (in bed) and decided to have strip wash rather than a shower. Asked PA to check for pressure sores as I can easily get them can result in stay in hospital. 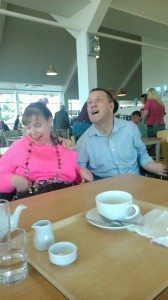 P A assisted me to get dressed and went into bathroom for teeth hygiene all facilitated by PA. Had BIG mug of coffee and felt ready for day. Went with PA to get vegetables for dinner and took Eben with me. Had long conversation with my choirmaster’s husband about our new season. Without ILF I would not be able follow my love of singing. Arrived home and asked PA to unlock office and fire up computer. Answered some emails then had lunch prepared by PA. Made sure my fluid levels were up as had nasty scare last week because I failed to drink enough I couldn’t go for nine hours. It is crucial to drink on the hour failure to do this will damage my kidneys. This of course does result in many trips to the toilet facilitated by PA and also the odd accident which means I have to have another shower and change of clothes. In the bad old days before ILF I remember having to dry my clothes (I had on) with a hair dryer. I also was forced into having a hysterectomy because I had very heavy periods and could not keep clean because of having only “pop ins” a few times a day. My ex husband was infertile and we were refused AID or adoption. I was still young enough to have children and this has always been a sadness. Had lunch mushrooms on toast prepared by my PA. Need to stop now as am going to exercise three dogs up the recreation ground with my PA who will assist me and pick up the pooh! Had pork roast cooked by PA.
Had bad night owing to pain needed turning six times. Failure to do this results in pressure sore with can lead to skin graft. Took dogs with PA walk on canal – got wet which necessitated PA changing me – find this tiring. Decided to have a shower and hair wash etc. Remember the days when I had to rely on bath nurse once a week my day was Monday and of course every Bank Holiday falls on a Monday so that meant waiting three weeks. In the evening I had dinner but as it was freezing decided to go to bed at 8.00 pm and play bridge on my ipad. No more not knowing when the community nurse would come at any time to suit her. This is 28 years ago and I was much younger then, even though I was the youngest on her list she often came at 7.00 pm. I am sure it was more about “power and control” rather than putting me to bed at a reasonable time. Had cup of tea and chat with PA had drugs (prescription) and settled down to good book. Another very disturbed night – having to wake my PA five times to reposition me. 25th August collect my friend from her home to go to the cinema, My PA drives for me and I can recall the days before ILF when I was imprisoned in my own home. I had absolutely no social life at all. When we got home me and my PA took my two dogs to the local recreation park. This was only possible because my PA was able to pick up the dog pooh. 26th August had to get up early to be ready for my student who I am teaching to update our website. The beauty of having ILF to fund PAs is that if I need to get up early or fancy a lie in I am able to do this. Before the ILF I was at the mercy of the home help service and had no choice or control in my life. Going back to the mid 80s when I was entirely dependent on statuary services I was controlled by whoever determined the home carers hours. I remember raging about the fact that it was impossible to visit friends or have relationships because I never knew the time people would turn up. There was a particular occasion when I met a man and invited home to stay overnight with me. I rang the social services department to ask them to cancel my visit. But they told me that was impossible so I locked the back door and stuck a notice on the door which read “NO HELP NEEDED MAN IN HOUSE”. During the afternoon I was visited by the person who operates the volunteer centre. She came to give me feedback on the IT support I had been giving to an elderly lady in my district. I had only been able to do this because my PA was able to take and collect me. 27th August Had to be up early for PA training as I am recruiting a new PA this went on until 11.00 am then I collected my friend and took her to Leicester to choose a new outfit for a wedding. Ate lunch in town then came home all with the support of my PA.
28th August Went down town with PA grocery shopping. Then made orange and chocolate cake with PA looks and tastes yummy! 30th August Had leisurely breakfast made by PA then had lunch after which my PA drove me to cinema film was mediocre. Had lovely roast cooked by PA. Both dogs up the rec with my PA – dogs had lovely time. Watched some TV then decided to have an early night, perhaps readers might think nothing unusual about this but in the old days before ILF I had no choice as to when I went to bed. 31st August Trip to Aldi to purchase the food for our holiday in two weeks. Came home PA put shopping away and we both had lunch. 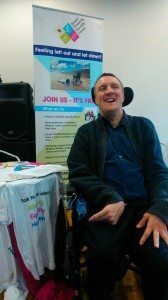 This diary aims to show how the ILF helps me to lead an independent life in the community. 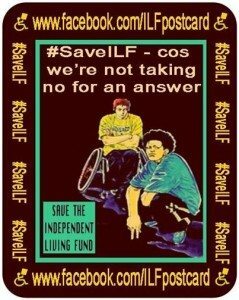 Without the ILF I would be trapped in my own home with no life. Today I met up with two friends, one of whom I knew at school and had lunch with them in a café. This is how the ILF helps with my social life. Today I went to an accessible climbing event where I sat on the Bristol Disability Equality Forum Stall in order to publicise the group and get more members.